Computer use is now an integral aspect of the vast majority of jobs in all fields. People working in a diverse range of jobs from secretarial to aeronautics are likely to spend long periods of time typing on computer keyboards. In addition, computer proficiency is a requirement of all learning environments, from primary school onwards. The standard QWERTY keyboard tends to be difficult to use with one hand, and research shows that it may lead to further injury of the affected or other hand as a result of flexion, extension and deviations in joints and muscle strain from holding hands and fingers in unnatural positions. Hand injuries account for 33% of all injuries at work, 33% of chronic injuries, 25% of lost working time and 20% of permanent disability. 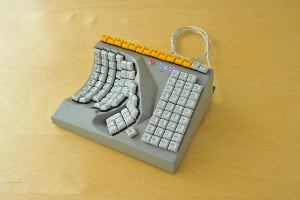 Maltron keyboards provide an ergonomically correct alternative to help people with upper limb disabilities and amputations to participate fully in the workforce and other settings such as schools and universities by making the computer keyboard more accessible. Typing speeds of 85 words per minute have been demonstrated by operators using Maltron single-handed keyboards. If you’re not convinced, a range of reviews from people who’ve used the Maltron single-handed keyboard can be found here and here. Contact us to order your Maltron keyboard today!